The aim of the AJC is to preserve the memory of the poet and to help raise awareness of his works. The association, created in 1967 in the framework of the law of July 1st, 1901 and now a legally recognised charity, organises and encourages events that are likely to further the association's mission. Since its founding, the association has been presided over by Georges Auric, Henri Sauguet, Jean Marais and Pierre Bergé. Its current president is Carole Weisweiller. Its honorary presidents were Francine Weisweiller (†) and Jean-Claude Brialy (†). 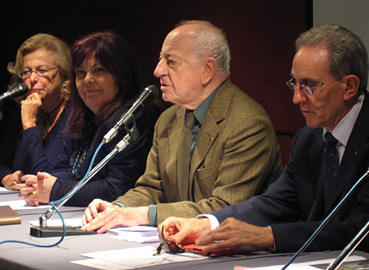 and Pierre Caizergues during the AJC general meeting in October 2006.